Mov ie review by Fr. Tom Condon, O.P. The Letters is a new movie which tells the story of Mother Teresa of Calcutta. As a Sister of Loreto, Teresa taught at a school for well-to-do girls in Calcutta for years. She loved her students and the sisters she lived with. Yet, more and more she felt a call to be with the poor. In one scene, Teresa sees a hungry family from her classroom window. She goes to her kitchen, takes some vegetables, and gives them to the family in the street. Teresa is criticized by her superior for breaking cloister, but she only felt more drawn to working directly with the poor. Eventually, Teresa takes a leave of absence from the convent so she can live and work among the poor. She is met with suspicion at first, as a Christian among the Moslems. The Moslems thought she was trying to convert them, but she continued to minister to the sick and dying, eventually winning over many of her critics. Young women, including some of her students, come to join with Teresa in her ministry. Teresa petitions the Vatican to found a new religious order, the Missionaries of Charity. Skeptics told her she would never get permission to found an order, but she proved them wrong. “Trust in God,” Teresa exhorts others throughout her life. 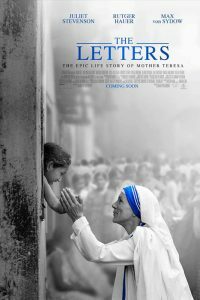 The title of the movie refers to letters that Teresa wrote to her spiritual director, Fr. Van Exem (Max Von Sydow) revealing the doubt she had in her life. Even though she always appeared strong in her faith, these letters, made public after her death, reveal that she spent many years thinking that God had abandoned her. Yet, she persevered in her work, seeing Christ in all. Near the end of the movie, we see Teresa accept the Nobel Peace Prize for her humanitarian efforts. This little Albanian Sister had become a symbol of holiness to millions throughout the world. Her embrace of the poor, the sick and the dying, along with the very simple lifestyle she lived throughout her life, were a great witness of God’s love to the world. This was true even in the midst of doubt and loneliness. British actress Juliet Stevenson plays Teresa. She is bent over, hard working, yet cheerful. Her encouraging smile and pat on the shoulders of many keep them going despite the enormity of their work and the exhaustion her sisters and followers must have felt. Curiously, Stevenson never seems to age as Teresa. I wondered if it was working on a small budget, not having the money for makeup and special effects that we’re so used to in movies today! The Letters is a simple movie, accomplishing its goal of telling its story without being splashy or calling attention to itself. In this way, it fits Mother Teresa well. It’s hard to imagine a big spectacle like Gandhi, with its all-star cast, as good as it was, working for Mother Teresa. She would certainly have disdained such a wasteful amount of money spent on her life story. In its modest way, The Letters is a fitting tribute to this woman who dedicated her life to the poorest of the poor, showing them the face of God, even in their dying hours. She didn’t want anyone to die alone, but surrounded by people who cared about them. In such a way she mirrored the heavenly kingdom that awaits them. I doubt that The Letters will play for a long time in the theaters during the busy holiday season with many big budget movies opening. However, I think it will gain a much greater audience at schools and churches for years to come.